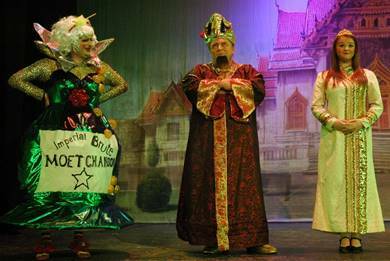 Take a Magic Lamp, a Princess, a couple of Genies and a very bad baddie and you have the story of Aladdin – the 2018 pantomime at New Mills Art Theatre. This is your chance to perform on the beautiful Art Theatre stage so before auditions, a Panto Get-Together will be held at 7.30pm on Monday, 4 September at New Mills Art Theatre, Jodrell Street, SK22 3HJ. Everyone is welcome to come along and meet our production team and register for audition. Our Director, Sean Stennings, Choreographer, Cathryn Yates and Musical Director, Tim Walker will talk about the panto, the characters, music, story and staging and will answer any of your questions. Audition dates will be held later in September. There are plenty of panto characters in the show: Aladdin, Princess Mandarin and her Dad, the Emperor; Wishee Washee, two crazy Chinese policemen; the evil wizard Abanazer; Genies of the Ring and of the Lamp and of course no panto would be complete without the dame – Widow Twankey! – plus more. We will also be looking for a strong company of dancers and chorus. Last year’s panto, Beauty and The Beast was awarded two Association of Community Theatre Awards: Debbie Howe for her evil portrayal of Belladonna and our Choreographers Ella Peatfield and Cathryn Yates picked up the Excellence in Dance award. This is the fourth time we have received awards for our annual pantos and we are delighted that Cathryn is choreographer for our 2018 Aladdin! If performing is not for you, but you would like to help out, please still come along to our Get-Together. You could join our Stage Crew, Technical or Front of House teams who are all volunteers, committed to providing high quality live entertainment for the community for more than 50 years.